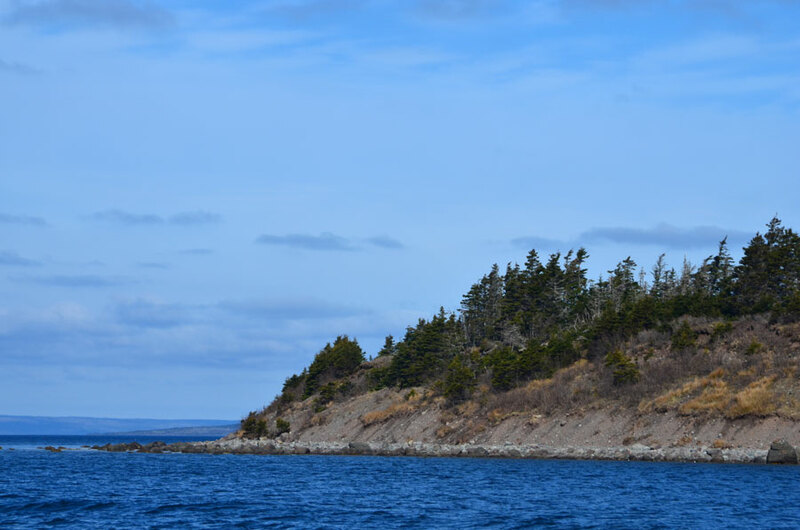 During my recent trip to Cape Breton I had the opportunity to go out on a lobster boat several times. 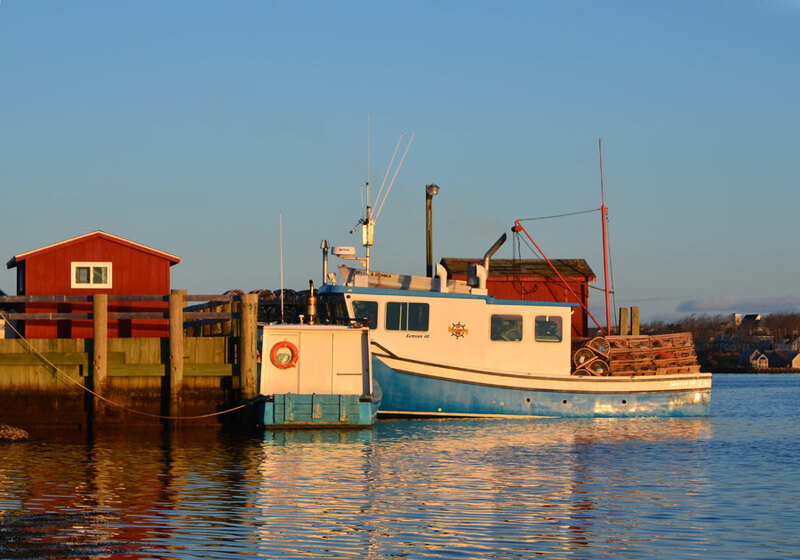 The lobster fishing season in this particular area of Cape Breton runs from May 1st to the end of June. 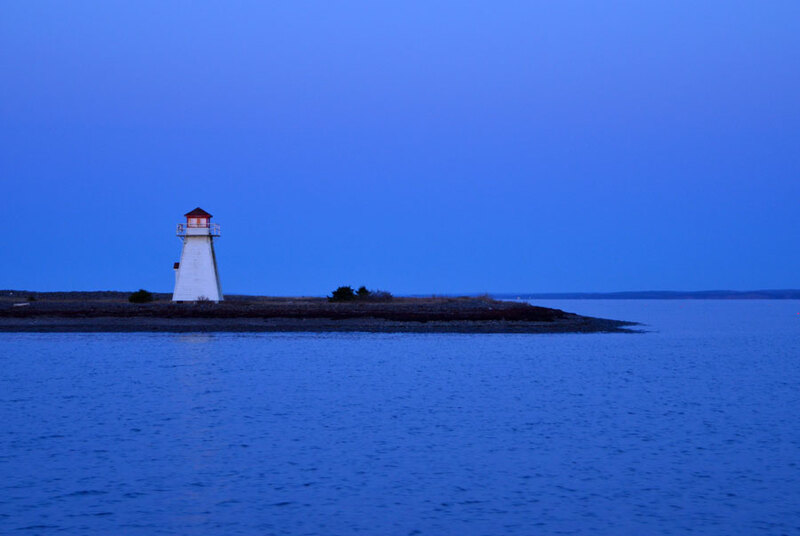 Generally, the boat leaves the wharf at 5:00 a.m.! 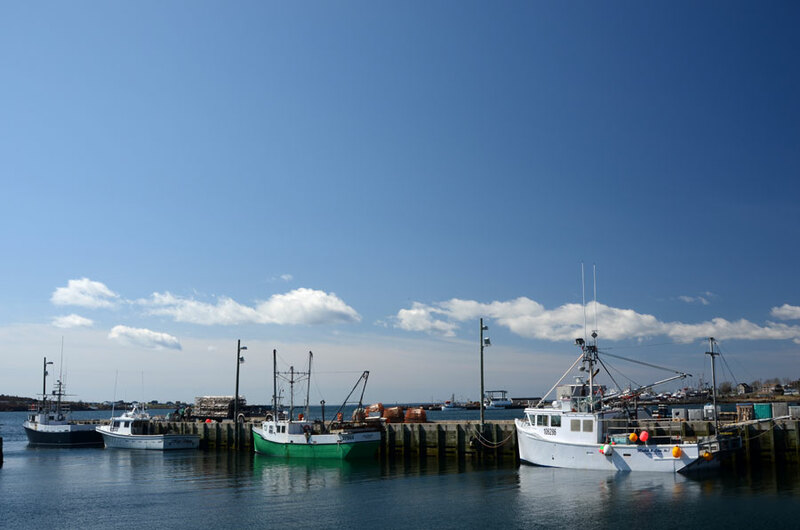 Above:Lobster boats in Petit De Grat being prepared for the fishing season. 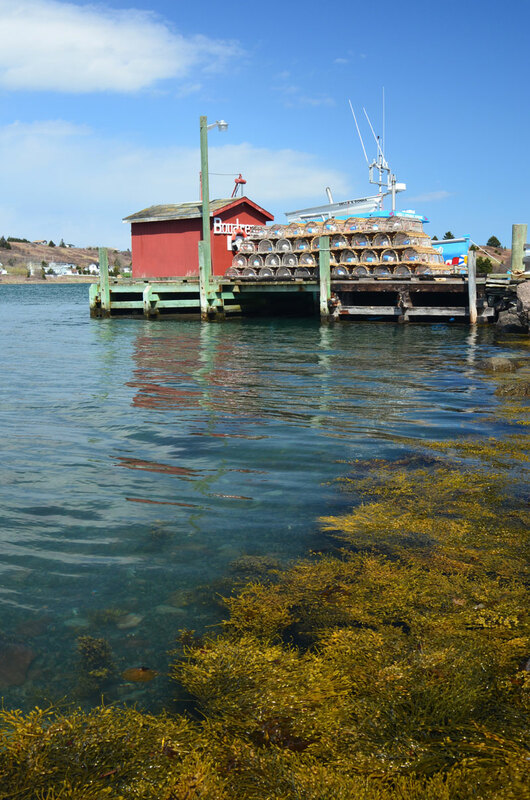 Below: A private wharf in Arichat loaded with lobster traps. 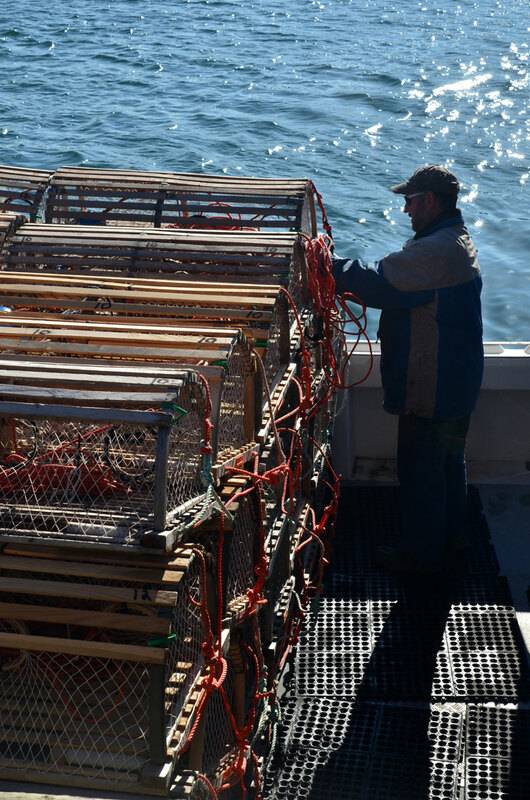 The first day out involves setting all the traps in place. 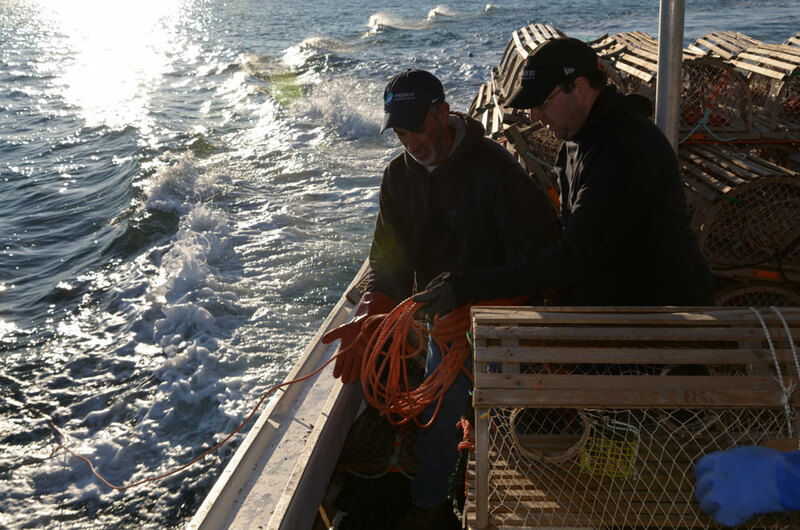 The crew of the boat I was on set 250 traps for the season. 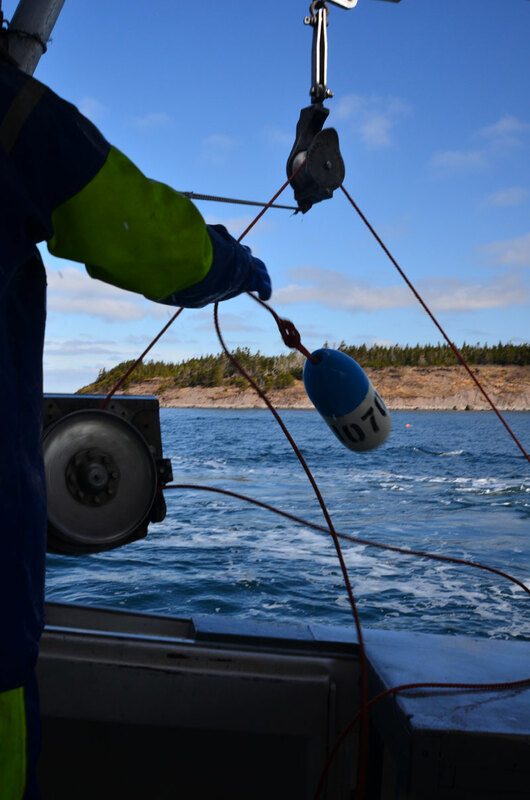 The traps have long ropes and buoys attached allowing the traps to go to the bottom with the buoys marking them for daily retrieval. 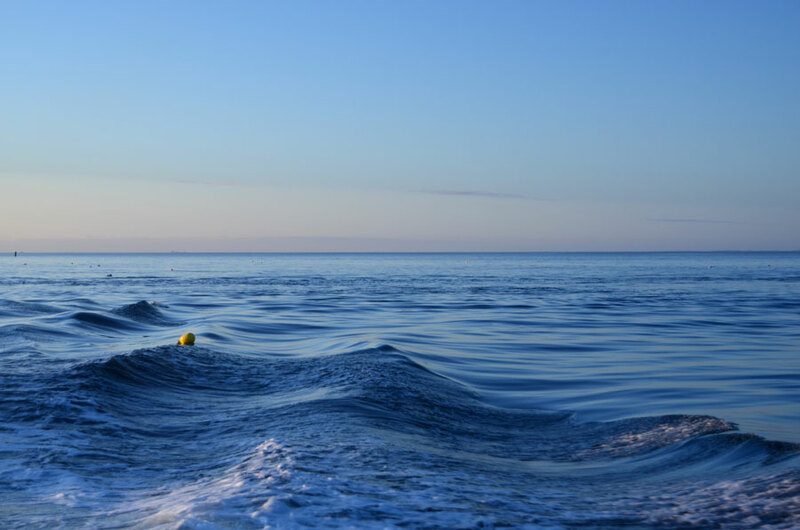 Each fishing boat has its own unique buoy style. 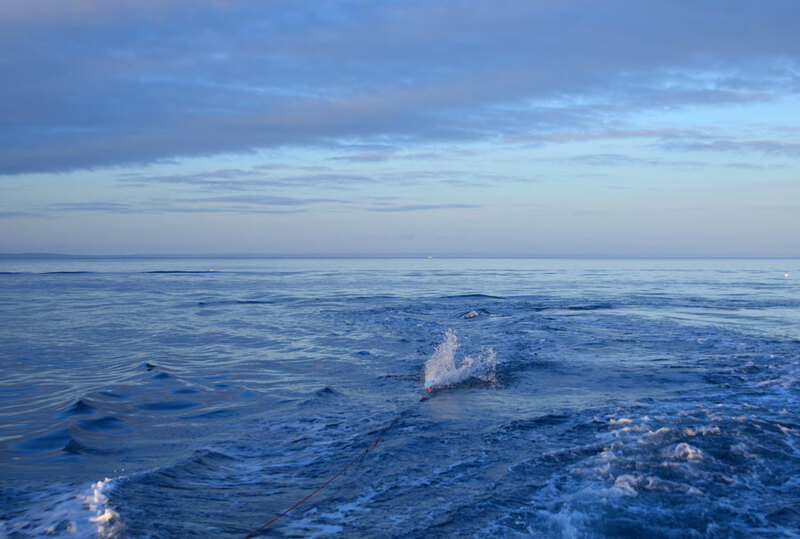 Below: a buoy trailing behind the boat. 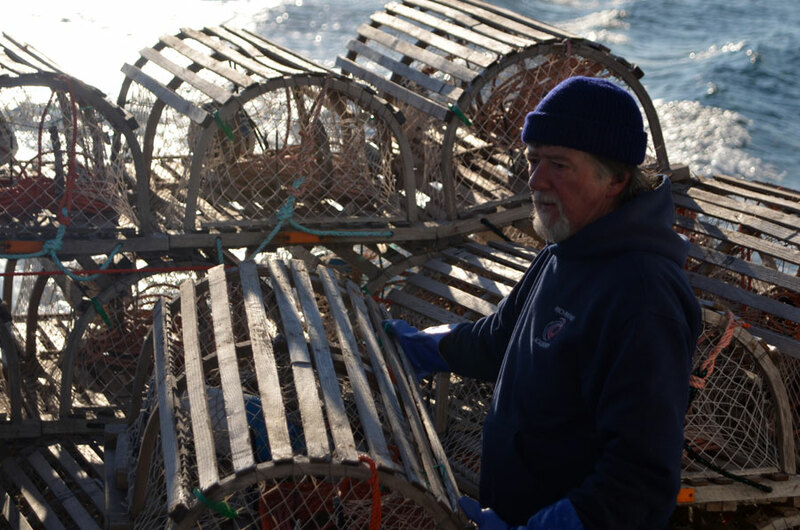 This fisherman has been lobster fishing in this area for over 55 years. 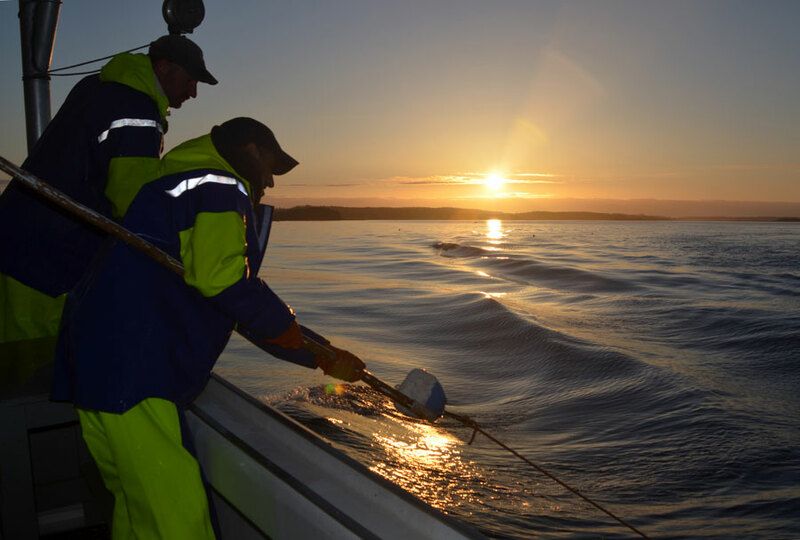 The gaff is a long stick with a hook on the end and it’s used for catching the rope and buoy so the traps can be pulled up for emptying each day. The rope then goes into a hydraulic pulley system that raises the heavy trap. 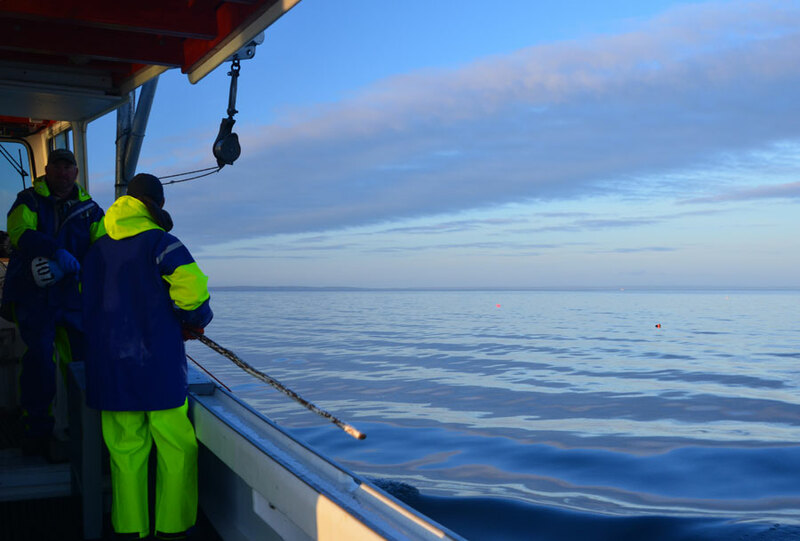 Baiting and banding stations. 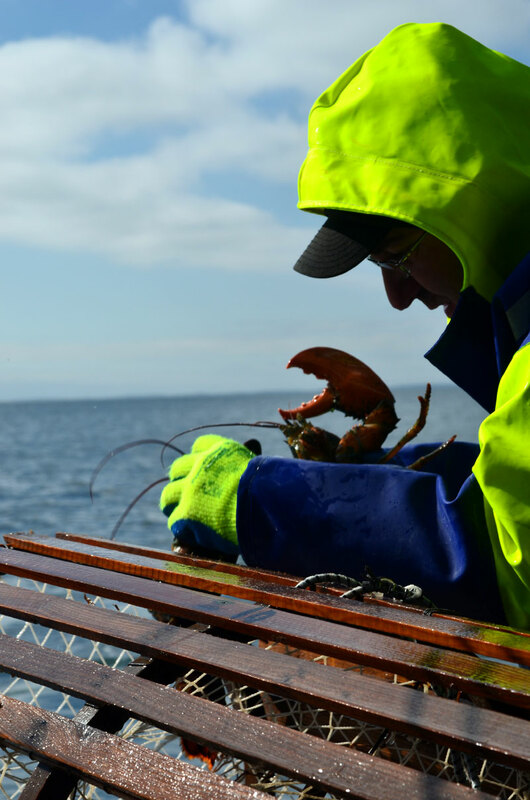 The strong claws of the lobster are secured with rubber bands otherwise they will grab hold of anything, especially fingers! 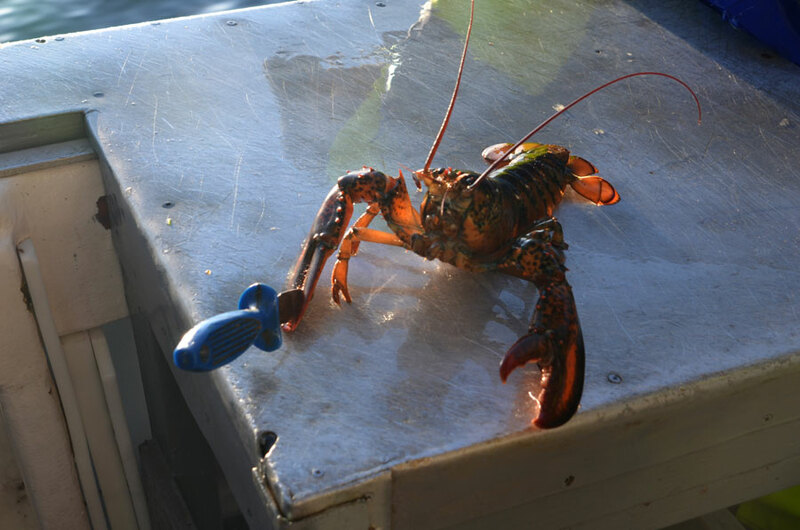 There are strict rules about the size and condition of lobsters that can be kept. 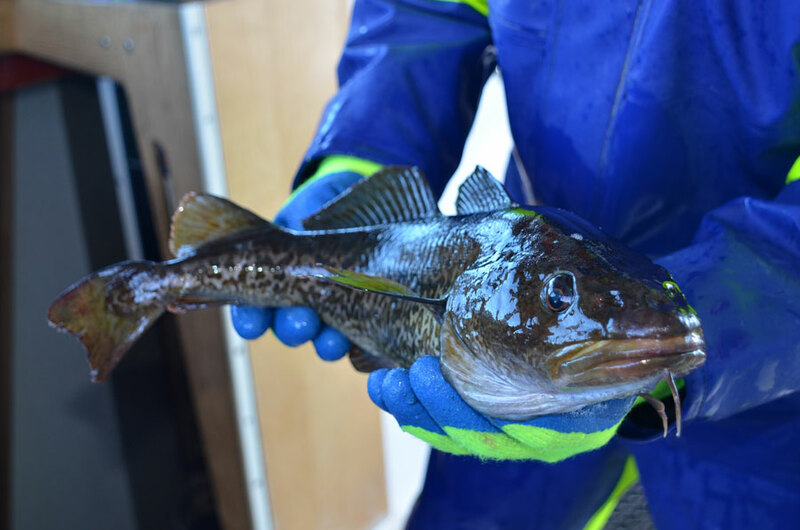 Female lobsters with eggs have to be returned to the sea; as do unhappy looking codfish that accidentally get caught in the traps. Some seagulls like to hitch a ride on the boat. 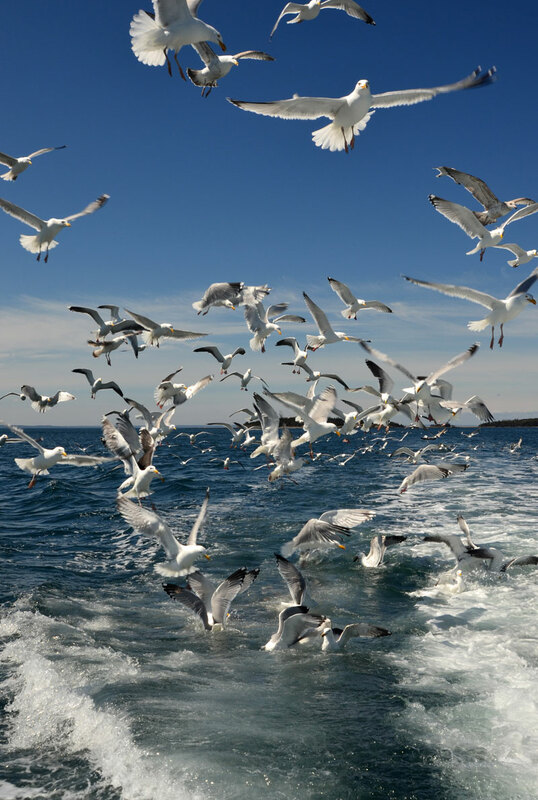 When fresh bait is put in the traps, the seagulls, very willingly, take care of the old bait as it is thrown overboard! 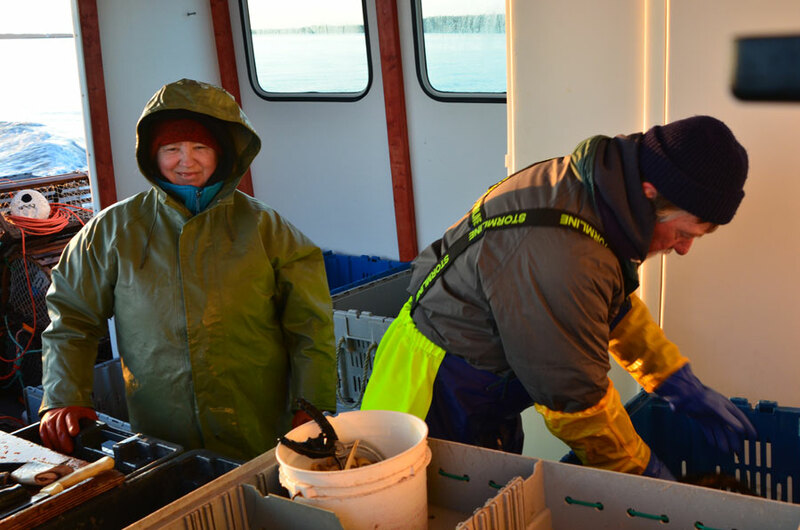 A big thank you to the wonderful crew of the Della & Donna! They are the great shots = seen by the clear eyes of cool customer. Photographer doesn’t creates drama but watching it ! Very nice lobster documentary, Karen. But my favorite is the seagulls, in the next to last picture. Those photos are amazing. 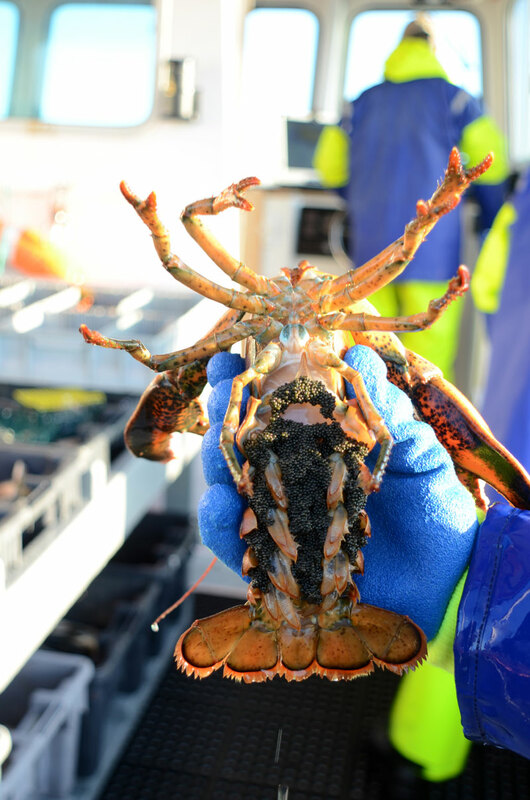 Love the up close and personal with the lobster – love it! Love the last shot – all the action of the seagulls and the water – so much movement. Very nice!! Great compositions, great story-telling. Very beautiful your photographs, fine. Art and adventure, thousands of cards, I really like. Great post! Educational and well illustrated. Reminds me of my birthplace, Salem, Mass., and how my mother taught me to “hypnotize” lobsters before placing them in the boiling pot (hold them, head down, by the carapace and stroke their tails into a curl until they become completely relaxed). Just beautiful. The faces, the colours, the seagulls in flight. A fine collection. 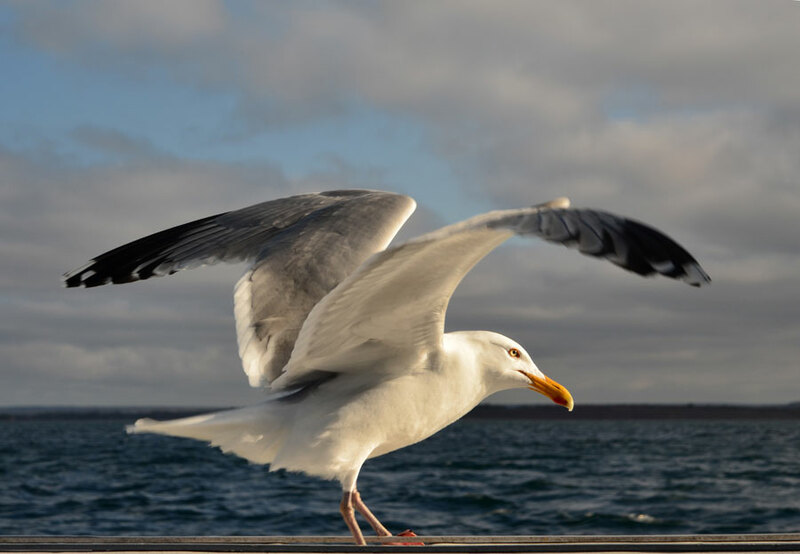 The seagull photos are particularly good and the last one is outstanding – full of action, wonderful detail, vibrant colours and beautifully captured composition. What a beautifully illustrated and written story… Thanks so much for sharing! What’s happening… bright colours !! Karen !! Nice photos! I was especially taken with the gull shots. They are some of the best I have seen. Ahhhhh lovely Karen, what a beautiful collection. Thanks for sharing these. Make me homesick …. publication fantastic, reminds me of my land where I live (Galicia) are many families who live seafood and work the same way, very similar. Hi Karen, nice series. I particularly like the silhouetted fisherman image. 5am is just a little too early for my liking. Glad you did it though. 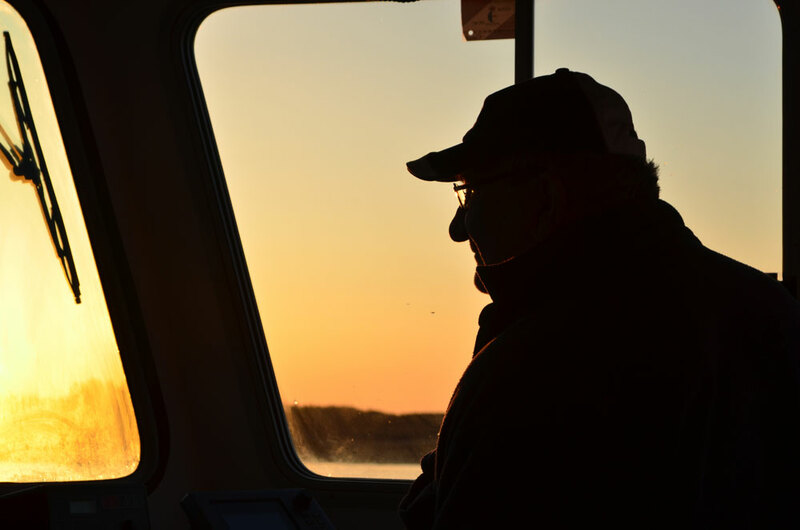 Very nice pictures, I watch these same boats from my windows every day but you captured the experience with amazing shots – love them all. 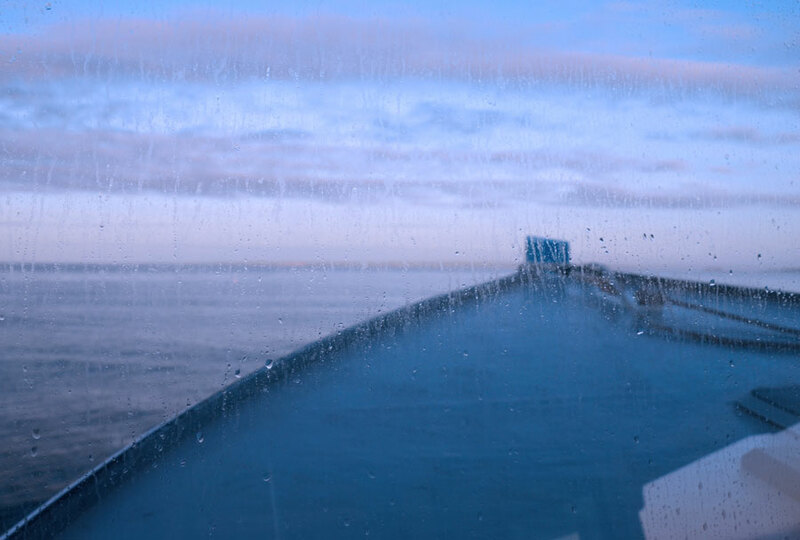 Really liked the feel of the sea and the industriousness of the crew…. must be a hard life. The last shot of the seagulls is magnificent. 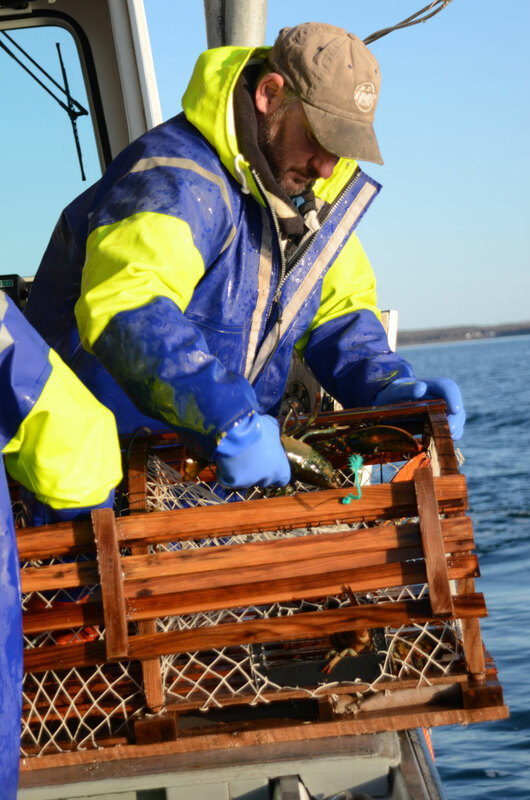 Would be interesting to know if lobster numbers have decreased over the years. Excellent story with spot on pictures. Must have been a lovely trip. Amazing photos, as usual. I love the east coast, the people, the ocean, the scenery and the lack of traffic jams!! Beautiful pictures of birds, Karen! Those seagulls! Incredible images! I feel like I am there – although as I am never up at 5 there is little chance 🙂 Wonderful! wow! You have got some very impressive images here! Love this post. What an amazing picture of the seagulls! Absolutely stunning…. Karen, I loved your story! 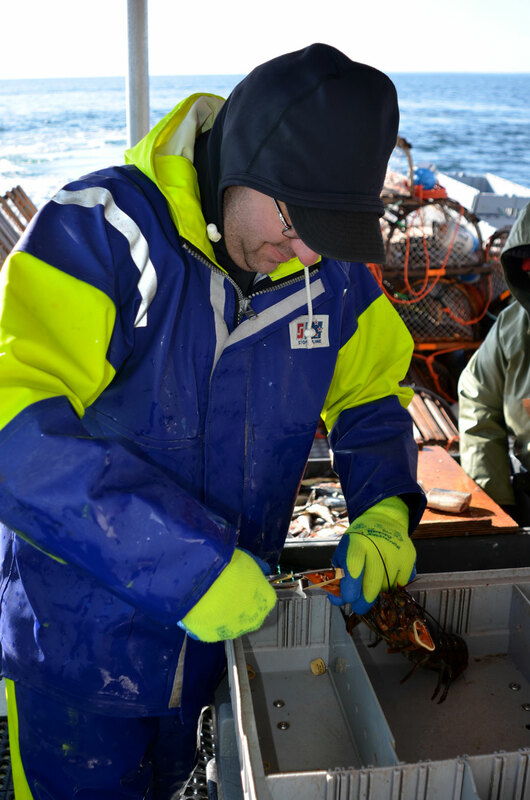 The sea gulls shots are spectacular, and the lobster with eggs, as well as codfish – so great! What a great experience you had! The last two pictures are breathtaking. 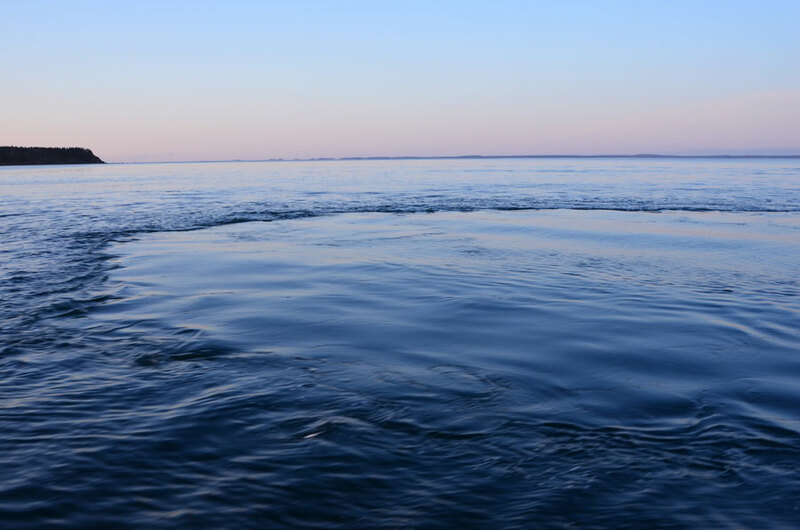 fantastic series Karen, a beautiful silken light on the water, and love the gull shots! Looks like an amazing experience. 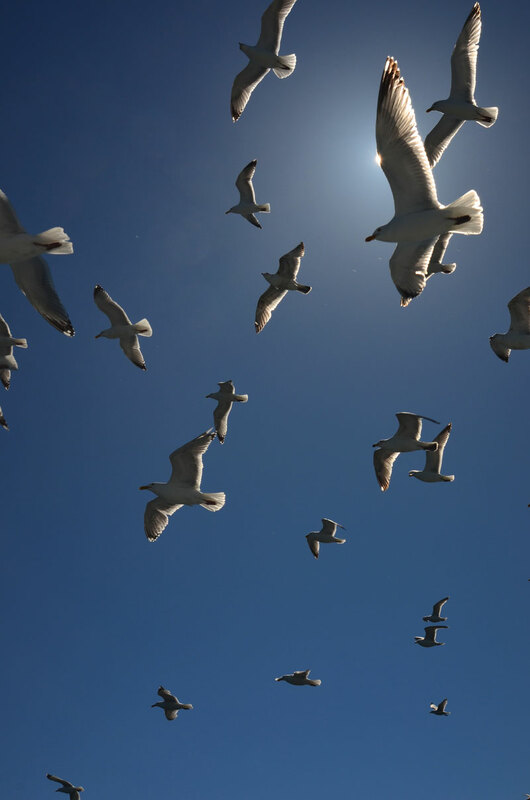 Have to say the seagull photos are my favorite. As with many of the pictures posted, the sea gulls were just stunning… I also enjoyed the picture of the gentleman in silouhette. love the seagull shots! Really fascinating story. I am really captivated by the last shot in your post. It is very surreal and captures the moment of chaos perfectly. It also reminds me of an M.C. Escher drawing with all the gulls descending simultaneously into the sea in a geometric fashion. Great shot! Those gull photos are just amazing! Las gaviotas que me capivated también. muchas gracias! The light in the 4th image is glorious — the golden hour of the morning.